Today I’m very excited to share my Classic Victory Rolls pinup hair tutorial demonstrating how to style this iconic vintage look inspired by the queen of pinups, Betty Grable. I’ve tried my best to go in detail on how to create this look, but if you do have any questions don’t hesitate to comment below. I have so many other fabulous hair tutorials planned to share with you very soon! Subscribe for more vintage fun! 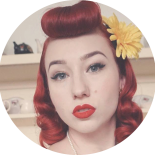 This entry was posted on September 11, 2018 by Miss Lady Lace in Pinup, tutorial, Videos, YouTube and tagged 1940's, 1950's, classic victory rolls, glamour, miss lady lace, perth, perth pinup, perth pinup blog, pin up, pinup, pinup blog, pinup blogger, pinup fashion, pinup girl, pinup life, pinup lifestyle, red lips, retro, retro blog, victory rolls, vintage, vintage blog, vintage blogger, vintage glamour, vintage perth, vintage pinup blog.